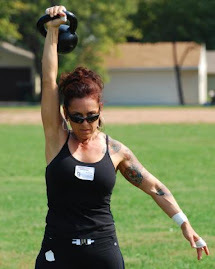 Tracy Reifkind's Blog Living My Physical Potential: Wow, What a RKC weekend! I just got back from assisiting at my second RKC, being assigned to Doug Nepodals Team, (I assisited Geoff Neuperts team in Arpril 07), and what an experience! The best part was, I was so much more appreciative to have the honor of assisting. I joke about attending Certs to simply ride coattails of my brilliant husband Mark, Master Instructor, acting as "unofficial" photographer, etc., but I will never miss an opportunity to assist again, and will do so anytime if they invite me back! The top photo is one of maybe 6 photos of the whole weekend, taken at the beginning of day 2. Part of Team Nepodal, Dustin, Matt, Kerry (co-assistant), Al, Derek and James. Boo hoo, I missed you this weekend! It was crazy, and Mark and I didn't plan well, arriving late and leaving early was the killer! I did swing by the farmers market though, on my way walking to the cert! yes, when Tracy is assisting neither of us get good pictures as the 'official' photog is off on another assignment! Oh crap... I should have stopped by earlier and snapped a few for you. I missed seeing you both. Saturday I spent the whole day as the official videographer for the Twin Cities Open powerlifting meet. After the meet, I had to show off my KB's to anyone who wanted a taste. Wow "official", did you get paid, lol? I can't wait for next years RKC schedule announcing teacher assignments is posted, it looks as if I won't see you again until, maybe June! I know Mark is teaching the San Jose Cert in Feb. which means he may not be on the schedule in April....and he's not teaching at level 2 this year either! I think you should find a powerlifting meet here in northern CA, come out and compete....maybe Maura could come with! I have a double size bed in the spare room....no more sleeping on the couch, lol!